On Saturday my cousin Sarah married Steve. With her permission, I will tell you about some of the records created as a consequence. 2 February 2010 Sarah Lees and Stephen Lees became friends. How would a future genealogist interpret this, especially if they did not understand how facebook works? For me, it was a treat to talk to the registrars who allowed me to examine the register (for Sarah and Steve’s entry only) and the ‘Certificate for Marriage’ that certifies that the required legal notice had been given, the civil equivalent to the reading of banns. As these certificates are not kept permanently, and do not find their way to an archive, I have not seen one before. So I can add a date to the above potted history of the relationship. Sarah and Steve both gave notice on the 22 November 2012. As a wedding gift, I presented Sarah and Steve with a pair of pedigree charts. As Sarah has dabbled in the dark genealogical arts, I wanted a chart she could add to. I also wanted to customise the charts with colour coding that indicates the quality of sources used. 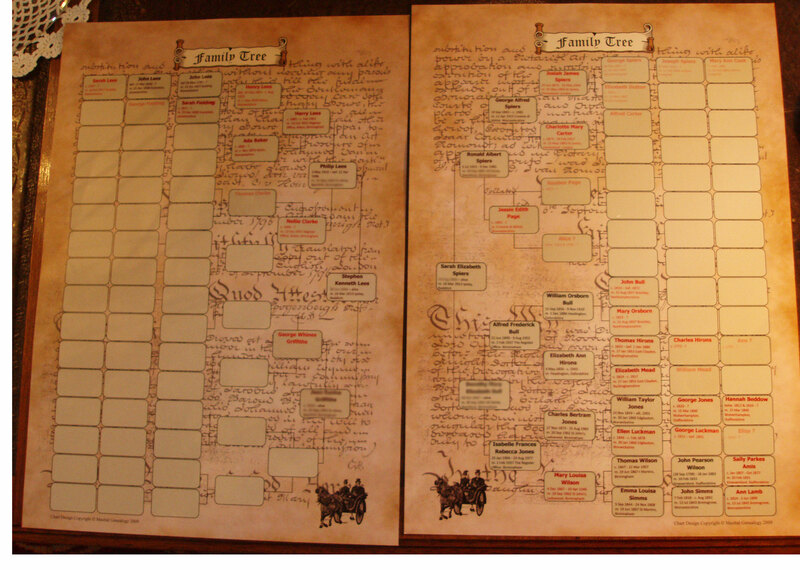 Maxbal Genealogy sticker charts proved a good solution. The chart stickers come on an A4 sheet and are a standard size, so it should be possible to use a mail merge once the relevant data has been extracted in appropriate format such as csv Extracting the information I wanted, name, birth date, death date, marriage date and place for each person, was not straightforward. The data is stored in Family Tree Maker 2010 for historical reasons.. However, FTM 2010 does not have a custom report that allows selection of data fields. Next I exported the data via a GEDCOM file for transfer to another program. I tried out both Legacy 7 and RootsMagic 5. Legacy has two reports for address labels and name labels, but these do not allow other data fields to be included. RootsMagic has a custom report that allows selections of data fields to create a table that can be exported in several formats. I used this report to gather the information for the direct ancestors of Sarah and Steve. As I had recorded multiple records for some events, further selection was needed. The colour coding is a rough guide to the quality of the source from which conclusions were drawn. 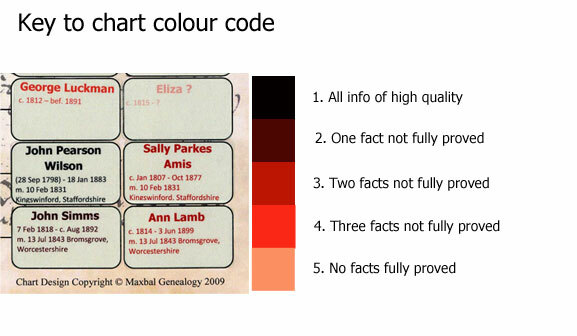 Each person’s data was ranked according to whether each of the name, birth date, death date and marriage details are based on the best available primary information from an original source. The darker the colour, the higher the ranking. Lower ranked, coloured in lighter reds indicate that there is still work to be done.